Is this the Android gaming device you're looking for? 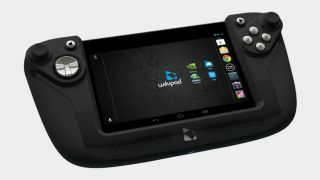 The makers of the "built for gamers," Android-based Wikipad tablet have confirmed it will go on sale in the UK on September 27 and will be priced at £249. The 7-inch device, which has been on sale in the United States since June, brings access to the Google Play store and allows gamers to dock their device into an innovative dual analogue controller. UK gamers may be slightly disappointed that the $249 (around £162) U.S. price point hasn't been converted directly into sterling, but unfortunately, in these circumstances, that's rarely the case. Likewise, European gamers will fork out €299 (around £256) to obtain the quad-core, Tegra 3 touting device, which the company claims is perfect for cloud-based gaming from portals like Steam. The Wikipad, which is completely unrelated to online encyclopaedia Wikipedia, is the latest of a growing array of Android-powered devices that promise access to AAA-like gaming experiences. The Nvidia Shield is now shipping, as is the TV-based Ouya console. Another competitor, the British-based GameStick console is set to arrive at the end of September, while Mad Catz' Android gaming device is also on the way. Recent rumours have also suggested that both Amazon and Google may be plotting standalone gaming devices, although nothing has been confirmed. Are high-powered, yet affordable, devices like the Wikipad and Nvidia Shield the future of Android gaming? Let us know your thoughts below.